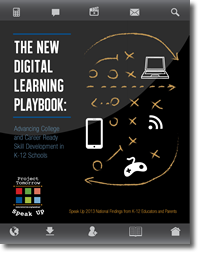 The New Digital Learning Playbook, Advancing College and Career Ready Skill Development in K-12 Schools is the second in a two part series to document the key national findings from Speak Up 2013. How do K-12 education stakeholders define college and career ready skills, especially within the context of digital learning? How are classroom teachers using digital tools and resources to support students’ development of college and career ready skills? How are schools and districts building up both their capacity for digital learning and meeting the new imperative of preparing students for an uncertain future? How can parents and community members support classroom use of technology and district goals for skill development? More than 40 percent of high school principals are now offering online classes for students in math, science, history and English/language arts. Only 17 percent of high schools are not offering online classes, according to school principals. Principals are offering online learning for multiple reasons, including providing academic remediation (66 percent), keeping students engaged in staying in school (63 percent) and providing options for students that need credit recovery (61 percent). Teachers who teach online classes, in particular, see a strong correlation between the use of technology and students’ college and career ready skill development. More than half of these teachers say technology use helps students understand how to apply academic concepts to real world problems (58 percent), take ownership of their learning (57 percent) and develop problem solving and critical thinking skills (57 percent). The professional development requests of teachers are fairly common among new and veteran teachers. Even new teachers, who are presumed to be more digitally native and comfortable with technology, have a wish list of professional development support. The rookie teachers have a greater interest than other teachers in learning more about incorporating games and using social media with both students and parents. Parental support of mobile device as part of learning does not appear to have an economic, community type or grade level bias. Around 60 percent of all parents said they would like their children to be in a class where using one’s own mobile device was allowed. Two-thirds said they would purchase a mobile device for their child to use within class, if that was allowed by the school. One-third of elementary school teachers (32 percent) report using games in their classrooms. The top two reasons given for using games within instruction were increasing student engagement in learning (79 percent) and providing a way for teachers to address different learning styles in the classroom (72 percent). 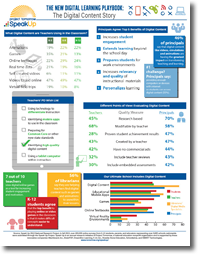 To download a copy of the first report on K-12 Student data, "The New Digital Learning Playbook: Understanding the Spectrum of Students’ Activities and Aspirations” please click here.